Home Basic Accounting What is the Accounting Cycle? Accounting cycle is a chronological order in which an accounting process flows. It is a step by step process followed to achieve the ultimate goals of accounting. Firstly, the information is recorded in a book or in a modern scenario accounting software called Journal. Then it is adjusted and moved to a ledger. 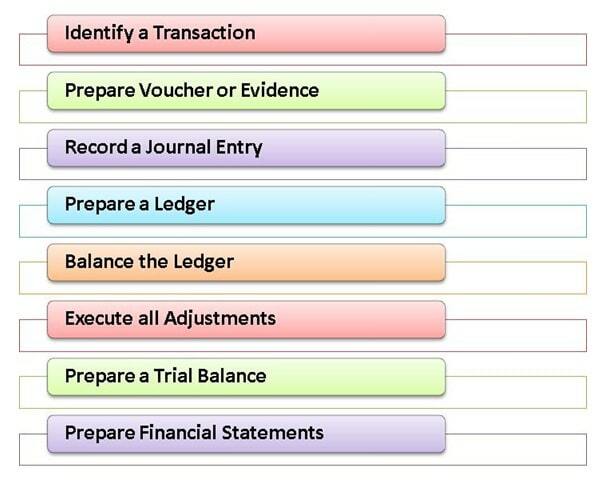 Ledger balances are then summarized to make a trial balance. Finally, from trial balance financial statements such as an income statement, a trading account, and a balance sheet are prepared. Unreal Corp bought a building for 10 Million, which was shown on the balance sheet as an asset. We will study a possible accounting trail behind this. Step 1 Transaction for buying the building is identified. Step 2 Evidence such as a legal ownership document is prepared. Step 3 A journal entry for buying the building is recorded in books. Step 4 A ledger account such as a “building account” is created. Step 5 Ledger account for the building is then balanced. Step 6 All adjustments, if any, are incorporated. Step 7 The amount is treated as an asset and moved to trial balance. Step 8 The amount is then shown on the asset side of the balance sheet. >Read What is Journal Posting?